Lock washers help hold bolts in place by providing a little extra resistance or grip on the bolt and the nut to secure the bind. They come in a lot of different shapes; some look like a split washer, others have flanges and still others actually have small teeth the compress and grip a bit. Removing the lock washer could be as simple as giving it a tug, or you may need to work it a bit and get some help from a lubricant if the teeth have dug in. Removing a lock washer is a snap. 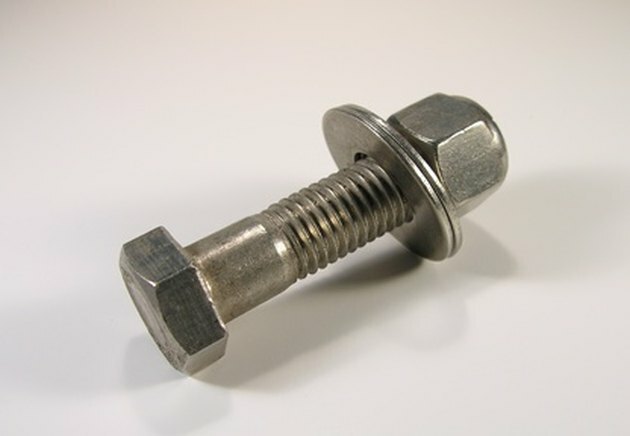 Remove the nut from the bolt using a socket or adjustable wrench. Pull the lock washer off, using the flat head screwdriver gently wedged in beside the washer to get it started if you need to. Use the screwdriver to work around the circumference of the lock washer to loosen it if the lock washer is still stuck. Work it off the bolt gently. Spray lubricant into the joint and allow it set for a few minutes. Then try again to loosen the lock washer with the screwdriver and pull it off. Work the screwdriver under the teeth of the lock washer if it has teeth and is still stuck. The teeth can bite into the bolt, jamming the washer. Be careful not to damage the threads on the bolt. If it is still stuck, try spraying more lubricant under the teeth of the lock washer and trying again.